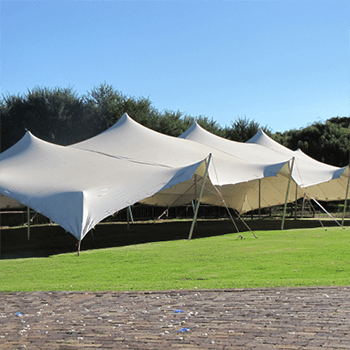 Stretch tents for sale in Benoni. Royal stretch tents was introduced into the tenting industry in 2003. Royal stretch tents offer a uniquely different perspective to your standard event tents to create a free form tent structure that will transform any event from ordinary to extraordinary. Royal stretch tents quickly caught the attention of the event tenting industry. Stretch tents now has become the preferred tent hire choice for a wedding tent, party tent, funeral tent, corporate event tent and a private function. Royal stretch tents is the leading stretch tent manufacturer in the world. Unlike other stretch tent companies, we have the ability to ensure our clients are offered the best quality product, utilizing advanced manufacturing techniques.